Sometimes the easiest way to do something is the old-fashioned way. Grandma’s cookie recipe, classical music, and the enduring elegance of the hat-glove-scarf winter combo – all are great because they’re simple and effective. Just like Celina’s Hay Tarps – easy to use, simple to install, and in just the right sizes! The outer side of the tarp is shiny silver, reflecting back the sun’s rays and allowing you to minimize the amount of heating that occurs. The interior is a dark matte black, keeping the inside temperature regulated to allow your hay to ferment properly to create the best feed. Each hay tarp has UV-resistance, adding to the silver top’s resistant properties. 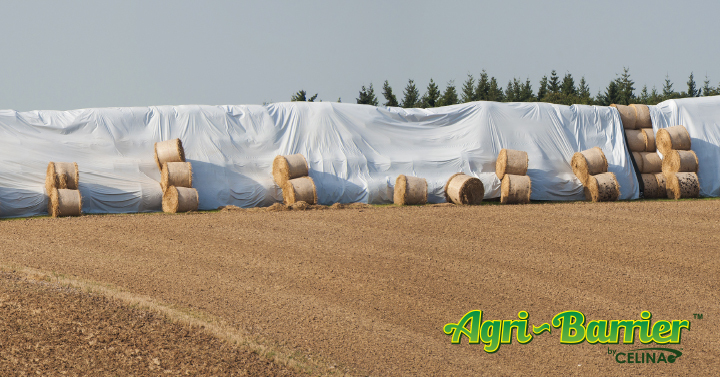 The tarps also protect your hay from wind, rain, and other weather conditions. After harvesting, hay can lose up to 20% of its nutritional value and usable value due to environmental factors. The best part about using a tarp to cover your hay is that you don’t need to drag the hay to your structure; the structure comes to you! All tarps are easily held in place using ropes, straps, or bungees; the tarps have grommets installed along the perimeter for reinforced, secure attachment points. Once the tarp is placed on the hay the rope or bungees are fed through the grommet holes. Stakes, earth anchors, or simple rods are driven into the ground near grommet locations – with the tarp tied to the anchors, your installation is complete! Four 24” Anchoring Hooks – easily installed by pressing into the ground or with simple hammering, the anchoring hooks are installed off of each corner of the tarp. Four 42” long Ratchet Straps – these straps connect to the stakes, with the ratchet buckle extending back toward the tarps. Four 84” Loop Straps – connected to the grommets on the tarp corners, the plain end of the strap is fed into the ratchet buckle to complete the anchoring system. With simple installation, easy use, and discrete engineering, the appeal of Celina’s Hay Tarps are anything but dull. With our easy hay bale size calculator, you can estimate exactly what size tarp you’ll need to accommodate your hay, whether square or round. Tarps can be ordered online 24/7 from www.gettent.com, or speak with our Celina Industries rep (via phone – (419) 586-3610x123 - or email) for answers to any questions you may have. Celina’s Hay Tarps – We’ve got you covered! Older PostAgriculture Barn Curtain Materials: What’s Best for Me?